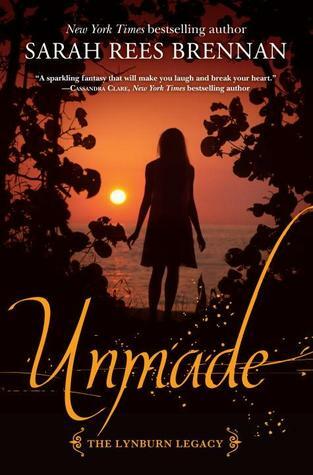 Unmade by Sarah Rees Brennan is the third and final book in the (The Lynburn Legacy #3) Trilogy. We had left Untold with Jared missing and Kami linked to his half brother/cousin Ash. Jared and Ash’s father, Rob Lynburn, has taken over the family home of Aurimere and the town of Sorry-in-the-Vale. In order to gain himself more power, he asks the people of the town for a willing sacrifice. When Kami linked with Ash as his source in order to stop Rob, she was provided with magical abilities of her own. With her family and friends by her side, can she save the boy she loves as well as her home town? I loved the first book in the series, Unspoken, and I thought Untold was good too. So I had high hopes for this book. But sadly, it didn’t live up to the expectations I had. 1. Exactly the same with no change to their personalities, despite the life-changing events engulfing them. 2. Completely out of character based on what was happening and their previous actions. There was very little shown by the characters in the way of grief for people that they loved, or were friends with, dying. There was a lot of angst. There was confusion, and subplots that didn’t really lead anywhere (Kami’s parents, for example). There were characters introduced specifically so they could die. This was the tag line for this book, and it should have clued me in straight away that I probably wouldn’t like the ending. I won’t reveal any spoilers except to say that I was stunned. The final battle scene was also a slight let down for me.